TAKE a rock in the Mediterranean, a vibrant town, excellent transport links and year-round sunshine. Add a world-class event and what have you got? A winning formula that is steadily propelling Gibraltar onto the global stage, blasting away the traditional ‘Britain in the sun’ stereotype. From February 11-16, the world’s best backgammon players are primed to do battle on the Rock for a share of an estimated £60,000 pot. The news was announced last September as the British Territory was accepted as the 24th member of the European Backgammon Federation. The odds of it becoming a regular fixture are high. The event will be hosted by the Caleta Hotel, whose annual Tradewise Chess Festival has been a roaring success since 2003. Named World’s Best Open by the Association of Chess Professionals for the past two years, the event brings 300 players from more than 50 countries in January. “This is the latest step in a highly successful policy of event-lead tourism,” Sports Minister Steven Linares told the Olive Press. Just look at the bullseye scored by the Gibraltar Darts Trophy. What started off as a small, local fixture has become a major global event, welcoming top pros and bagging hours of international TV coverage. This year saw Michael Van Gerwen crowned victor after seeing off defending champion James Wade, as well as four Gibraltarian challengers. The Chess Festival has welcomed a string of world champions over the years, with grandmasters and amateurs representing 59 federations worldwide in 2015. Since 2011, there has also been a junior tournament. And like the chess, the backgammon will be live-streamed over the internet to an audience of millions. The timeless board game, mentioned in ancient Persian writings, requires skill, experience and extreme concentration. Some contestants are known to film their matches and analyse them when they get back to their rooms. 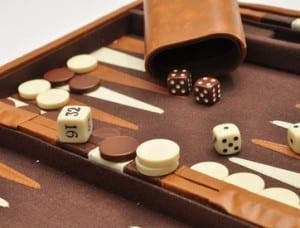 While chess tends to attract the studious sort and darts is represented by a more vocal, beer-swilling crowd, aficionados say backgammon is the sociable experience. Players often bring a ‘support’ entourage – partners and even families – to urge them on and there is a convivial atmosphere, with spectators milling about and chatting in the arena. But the tournament is not just about bringing in the world’s best players and showing them the sights. These events depend on grassroots support. As with the chess and darts, Gibraltarians will have the opportunity to compete in a smaller tournament, with the four best players winning a free place in the main event. It’s a winning formula that has been virtually patented in Gibraltar, and the game plan is about to be applied to ‘four or five more events in the pipeline’, Linares has hinted, although he won’t be drawn on details. The only problem will be finding a free ‘window’ in Gibraltar’s busy events calendar, as festivals devoted to music, literature, wine, beer, food and beauty (Miss Gibraltar) have already bagged their dates. NINETEEN years. That’s how long it took Gibraltar to become a fully-fledged member of European footballing body UEFA. In stark contrast, the backgammon equivalent welcomed Gibraltar to its ranks just six months after it applied. And becoming the 24th member of the European Backgammon Association is already reaping rewards. The president himself has been lured to the Rock to become tournament director, bringing a team of five experts with him. The event is the first of a three-part series, along with Copenhagen and Cyprus, for which there will be a fat cash prize for the overall winner. 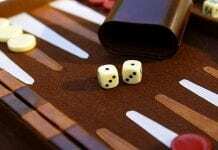 THERE are some who dismiss backgammon as a game of chance, not skill. Why would anyone want to fly hundreds of miles to play a game they could lose on the roll of a dice? It’s true that if Lady Luck is on your side (and providing you know how to play the game), anyone can beat the world champion. But that’s why a backgammon match consists of more than one game. Over a ten-point match, luck balances out and the better player will almost always prevail. THE chess tournament is now obliged to install cameras in the corridors surrounding the arena and in the entrance to the toilets to deter cheats. Players have been caught sneaking off to the loo and conspiring to fix a game or agreeing to draw.